i putted some patterns on her T-shirt because it really was very very empty and of course I left them their shading(meaning i made them myself) and I haven't putted him anything because it's not his stile. edit: wow youve got elite! well done sis! i agree about the mouths, and while i like the colored outlines, i think the outline color on her skirt and his hat need to be different. darker blue for the skirt and grey for the hat. also, although the sun seems to be hitting his hair in a soft way, the rest of the scan doesnt really reflect that, so i think you shouldnt have blurred the highlight so much. ll and i wish you spent a tad more time on his toes, but toes are so difficult. and the pebble, i wish you did a light colored outline for it --"
nanami is cute,the something that make me love this anime is their smile.it's so lovely. I really like the vector and the beach. Also, great idea with Yano drawing a heart, too bad the sea shell isn't well defined. Other than this... I love it really much. Really nice wallie. Simple and cute. 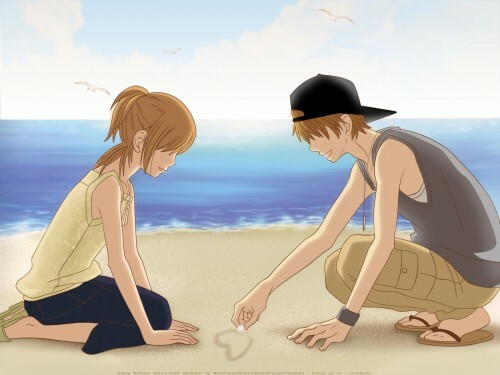 Waaah this one really really romantic scene on seashore (love it) especially on Yano wrote love sign on sand, it's very touched. Nice wall! It's elite image! I love its soft tones, its peace and the affection it implies! It is wonderful in its simplicity! I love the blue sky and the sea too!